Enjoy a relaxing two hour sunset sail while leaving the hustle of Waikiki behind. As the sun dips below the horizon coloring the sky with shades of orange and pink. Watch as the sunset colors contrast against the deep blue ocean, . Complimentary bottled water, soda and light snacks are served all in a very casual atmosphere. Guests are welcome to BYOB but must be 21 years old. 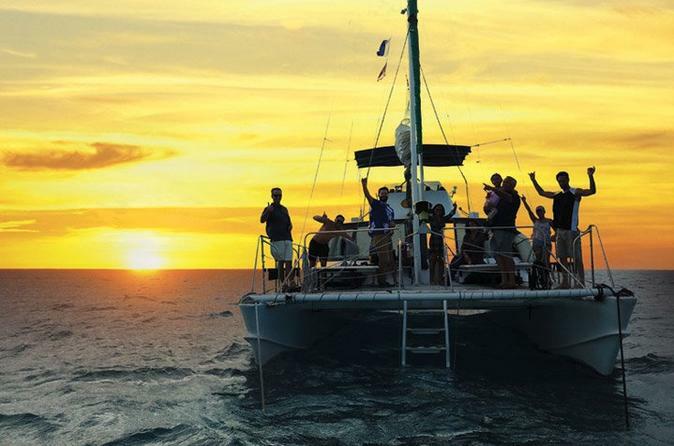 Come and enjoy a relaxing sunset sail away from the crowds and noise of Waikiki.While on board the Kahala Kai you will be treated to a colorful sunset of orange and pink hues creating a memorable experience. Your evening excursion departs from Kewalo Basin 1020 Ala Moana Blvd. slip A 0 at 5:30 PM. Google map Oahu Catamarans to land within twenty feet of location. The night view of Waikiki is a view that few get to experience. Light snacks consisting of Cheese and crackers and fruit will be served on board. The Kahala Kai is a forty foot Coast Guard inspected forty nine passenger catamaran. We limit our sunset sail to 25 passengers for your comfort.